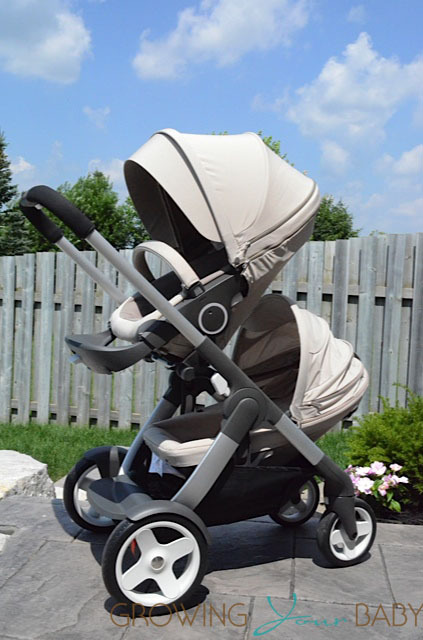 Home » Stroll in Luxury with the Stokke Crusi! Well known for being one of the top manufacturers in the luxury market, Stokke recently debuted their first double stroller. Moms who are fans of the brand have been asking for a double stroller for years and now, that time has come. The Crusi, Stokke’s new stroller, is perfect for parents who are looking to add to their family because it can be expanded to a double stroller. 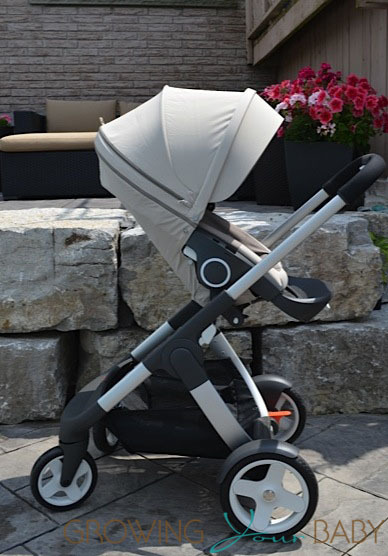 Sleek, modern and versatile, this luxurious stroller is ideal for urban and suburban families. We were able to get our hands on one and have been putting it through the paces for the last couple months. Out of the box all you need to do is pop on the wheels, install the seat, foot rest and canopy . Stokke shows these steps in the user manual, but they are so natural it’s unlikely that you will need it for install. 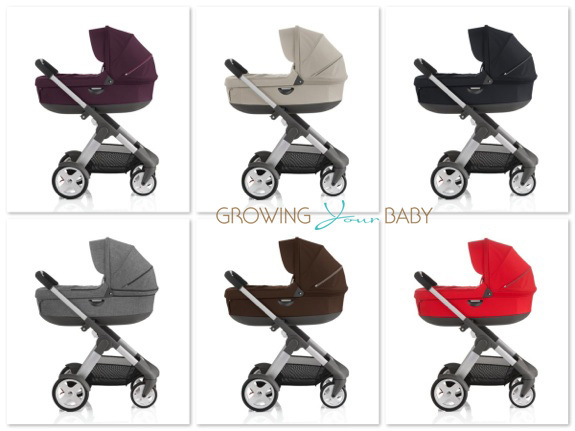 In single mode the Crusi can be used with the optional carry cot or stroller seat. In the past Kiersten reviewed the Xplory, but this is the first Stokke I have tested and I love the height of the seat. Your child sits at the perfect height to see the world. This is much higher than other brands, but it gives your little one a great view! The Crusi uses the Xplory seat and it is the perfect depth and height for riders of all sizes. Configurable in three harness heights, the seat can also be reclined flat to accommodate a sleeping baby. Normally this is done by pressing a lever at the back of the seat, but on the Crusi, the recline lever is under the seat, which I think a great idea because once you get the hang of it, it is very smooth and easy to do. 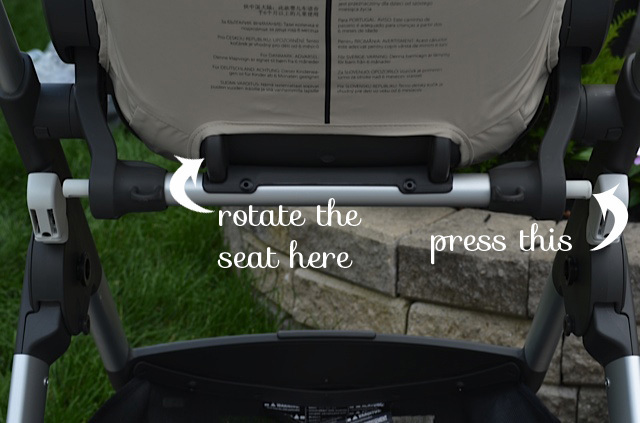 The stroller is also fitted with a removable seat insert for small babies. 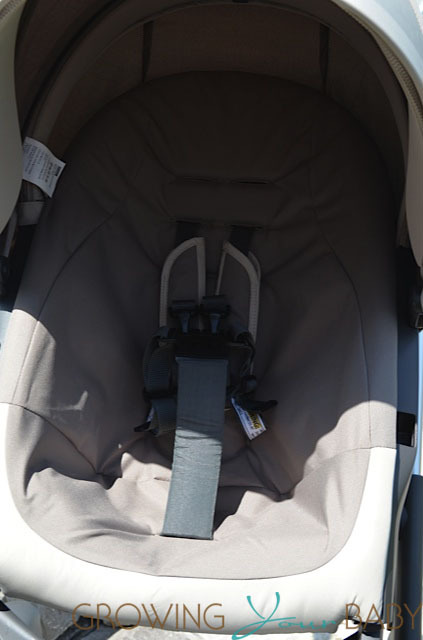 Facing you or facing out, the seat gives babies the options to see the world from all sides. As your baby grows, you can adjust the footrest to fit their size. The seat is positionable to 3 recline positions when facing you(sleep, rest and active) and two(rest and active) when facing out. This makes sense because the position for a sleeping baby can only be done when facing you, which is perfect because it keeps your newborn in sight at all times. Sometimes with seats that are re-positionable, parents are worried that it is not in properly. 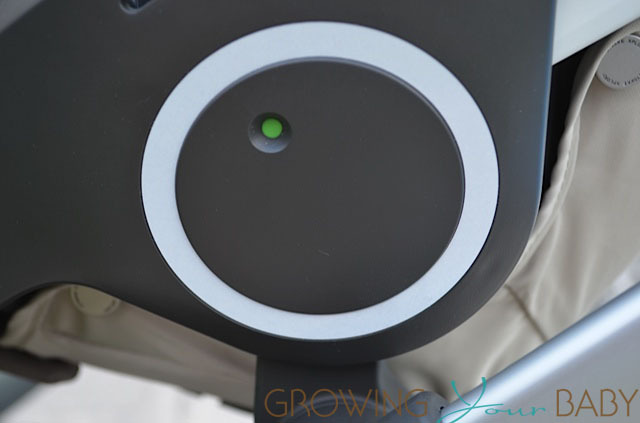 To ensure you always know, Stokke has create a color system on the side disk that will turn to green when the seat in connected perfectly. There is also an audible click that the seat makes to let you know it is in. The canopy on the Crusi is one of the most robust ones we have tested. It is not the biggest one on the market, but it does a great job of keeping my son shaded. Plus, there is a mesh panel for better ventilation on a warm day and visor that pops up to help reduce the glare on a sunny day. The storage basket is spacious and sturdy. It will easily hold a large diaper bag and whatever else you will need to bring for a day out. Accessible from all sides, it also has a drawstring back that allows you to keep your stuff secured if you are loading it up. Parents who are adding a second child to the family will like that the Crusi can be expanded to be used as a double stroller. To install the second(sibling) seat you need to chose which position that you would like the first seat to be in, because the bracket for the second seat goes over the recline lever. Then install the included brackets on each side and attach the additional footrest. The second seat pops right in and then the main seat on top of it. This can be done in under 10 minutes the first time and half that every time after because the foot rest can be left on for subsequent trips out. What is unique about the Crusi is that when using the second seat both children face you. I like this set-up but wish there was a way that I could use more of the storage basket when a second child is in the stroller. As you can see from the image below your access to it is limited. The sibling seat(the same one used on the Scoot) is smaller than the main seat so I would recommend using it for your youngest child but not an infant. In the past I have found that my oldest cared more about where he was sitting because there was a time when only he sat in the stroller on his own. My youngest just likes to be pushed around so positioning isn’t important to him. It has a weight limit of 35lbs and has a harness that can be adjusted to 3 heights. For my test, I have been using the stroller with my boys and we also took it out with my twin niece and nephew. The twins are a bit smaller than my boys so it gave me a chance to push the stroller fully loaded and with only about half of the weight capacity. 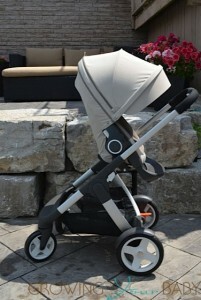 The Crusi has a smooth, easy push and regardless of who was in the stroller it moved effortlessly over the sidewalk. I also found it did equally as good at the park while going over the grass and was perfect for the mall. It is not an all-terrain stroller so I wouldn’t recommend it for sand or loose gravel. 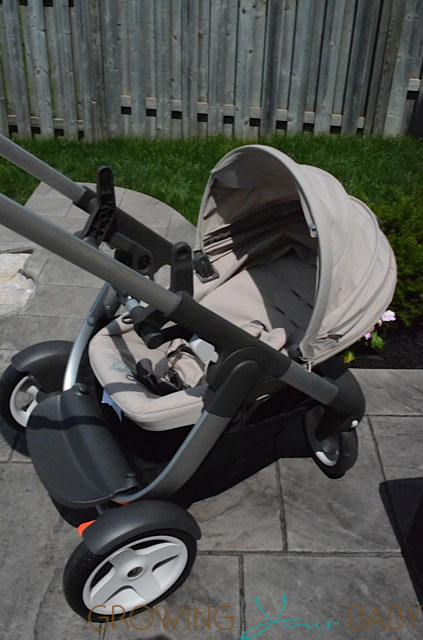 Stokke uses low maintenance foam/rubber wheels to give the stroller its smooth ride. 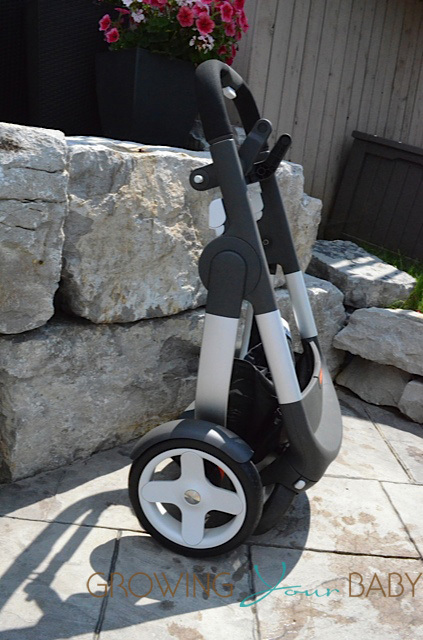 With a combination of two 10″ on the back and two 8″ of the front, the stroller is able to go over most urban terrain. To fold the stroller the seat(s) need to be removed. The close is not dramatic (like the frame folding in half) because all that happens is that the wheels fold together. Two levers at the side unlock the frame and the wheels merge. 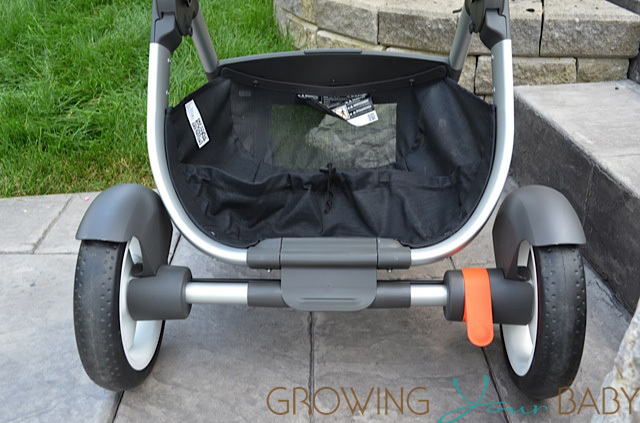 The telescopic handlebar needs to be pushed in for the stroller to fit into your vehicle. If you lock the front wheels the frame will stand independently. For easy storage the wheels pop off with just a push of the center spoke. We tested the Crusi in Beige. It is also offered in 5 other colors. 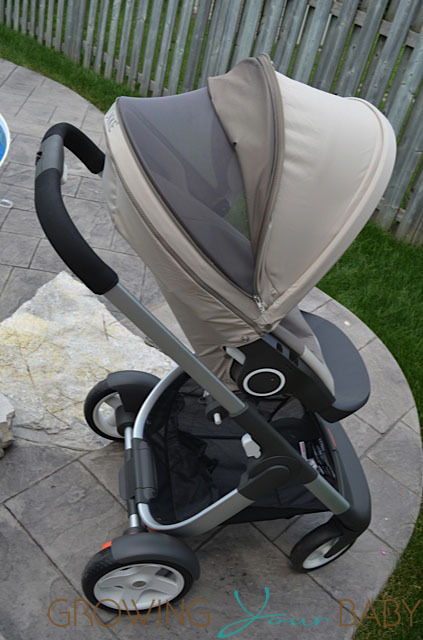 The stroller comes with an infant seat insert, a rain cover, mesh net, bumper bar and cup holder. 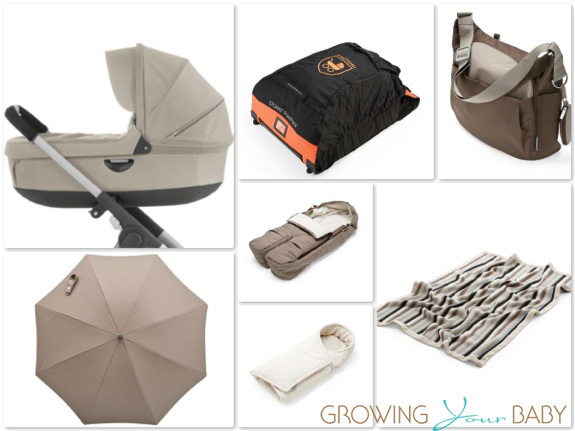 Stokke also offers these accessories for the stroller as well. I really like this stroller. 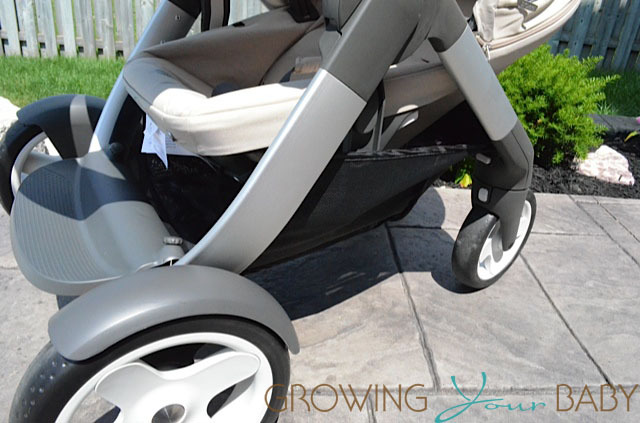 It is easy to use, a dream to push and a great buggy for moms who are out a lot. If I were asked what I would change I would have it so that both kids could also face out. While I know my boys love watching me when we are out they also like to see where we are going and enjoy the same view I have. I would also like to see Stokke add a frame lock.